Mamma Rina Kiosk is located at around 10 km from Bologna, at 200 meters from the country road SP 569 Bazzanese. 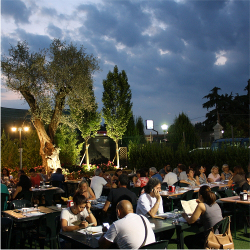 The kiosk is surrounded by a green area and stands next to the sports complex “Enrico Filippetti”. Mamma Rina’s menu offers two specialties of the Bolognese culinary tradition, the crescentine, in the classical version or in the green version with spinach, and the tigelle, also available in the “squared” version, a variation of the typical rounded tigella of Modena area. Crescentine and tigelle are served with local cold cuts and cheese which comes fresh every morning from the nearby dairies. Cheese can also be paired with fried side dishes and home-made desserts. Mamma Rina offers a homey atmosphere in a relaxed environment, with affordable prices and high quality products.